Insinc – win cash by taking train trips off peak! So I have been enrolled in Insinc for over a year now. Insinc, in their own words is about”Incentives for Singapore’s Commuters”. Simply sign up here and register your EZ-Link card that you use every day. You earn points by taking train trips using the CEPAS card registered in Insinc. You will automatically earn 1 point for every 1 kilometre travelled on the train all day Monday through Friday, weekends don’t count. Designated decongesting hours earn extra points – see table below! You can earn 3, 4, 5 or 6 points per kilometre in decongesting hours if you are Bronze, Silver, Gold or Platinum! Over $200 in total. But this is just a small amount out of the over 3 million SGD they have paid out so far. I’ve had to attend a workshop in Sydney and needed something within budget and yet within walking distance from Hilton. This was one of the hotels shortlisted by our travel agency and I settled for this primarily for the distance I have to walk at 8am in the morning. It was a huge mistake. While I had done my homework and saw that the hotel lobby is nothing but just some shop space between Subway and a coffee joint, I didn’t expect the lift lobby to be so narrow that there is only space for 3-4 pax to wait for the lift at any one time. There is no bell service or even a trolley. You’ll have to carry all your luggages up by yourself. Room is very small and not suitable for claustrophobic people. The toilet floor was extremely cold and my room window opens up to roofs of nearby buildings so all you can see are the water heaters and ventilation shafts. Each room toilet has an individual water heater that makes a loud banging sound when you switch on the hot water. There is instruction pasted near the shower stating that due to weak water pressure, guests have to turn on the hot water to the maximum for 45 seconds before easing in the cold water until the desired temperature is reached. The air-conditioning in the room is nothing but a centralised heater that runs noisily like you have an old air compressor in the room. Even though it was winter, the room felt extremely warm with the air-conditioning on. Switch it off and you’ll have no ventilation. I made a call to reception and the staff politely said that I would have to open the windows if I need ventilation and cool air. And If I need more ventilation, I can proceed down to get a table fan from them. In the end, I went down to get the table fan. Maybe I’m spoilt but I wouldn’t want to spend my birthday in Sydney in this run-down place. I called the Duty Manager, Anthony, to cancel the last 2 nights out of my 4-night stay. Anthony politely rejected my request but I put forth my reasoning and he agreed to come back to me after consulting higher management. 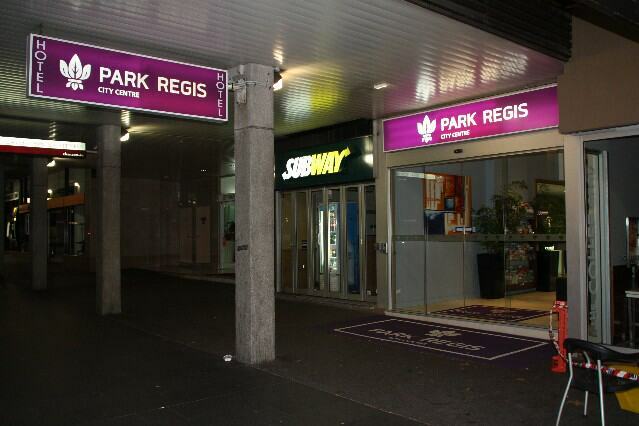 In the end, Park Regis agreed to cancel the 2 nights but will only refund me 1 night’s charges. To be absolutely fair, the hotel is clean and safe. The frontdesk is manned by very service-oriented people. If you don’t mind a no frills hotel, then stay here. If you’ve been spoilt by 4/5-star hotels, stay somewhere else. I didn’t even feel like taking a photo of my room during my 2-night stay. I am currently in Westin, Sydney as I am typing this review.